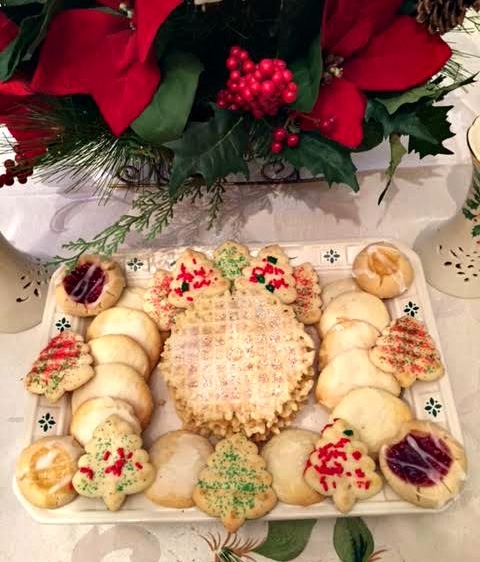 At this time of year, friends share holiday treats and stories of their family food traditions. Their recipes hold long-treasured memories kept alive by us for the next generation. While we come from different places — Hungary, Italy, the Ukraine, Poland, or Puerto Rico — the stories are similar. Some of them are about great cooks, some about those who could not cook at all. Some of the stories are wistful, like longing for the crusciki recipe that died with a friend’s mom. Some are joyful, like enjoying rice pudding with coconut and cinnamon. It’s the rare family that doesn’t have some tradition to share, from sitting around the table all day making pierogies, to sharing twelve dishes for the twelve Apostles on Christmas Eve, to enjoying a whole roasted pig wrapped in green banana leaves. My family’s holiday baking tradition is making Hungarian nutrolls, a recipe passed down from my mother’s mother, whose family hailed from that country. It’s an all day process, from preparing the yeast dough, to rolling the pinwheels, then stuffing them with chopped sugared nuts. Ricotta is one of those ingredients that’s impressively versatile. From appetizer to pasta to dessert, this creamy cheese is as adaptable as it delicious. In this case it makes for mouthwatering, softly baked cookies. The glaze makes these cookies. Their soft cake-like texture is another selling point as they literally melt in your mouth. And you can’t stop at just one. Try these this holiday season. They can be dressed up any number of ways, from adding a little lemon juice to the glaze, to adding decorative Christmas colored sprinkles on top. If your holiday shopping takes you to Delaware, try to find the ricotta made at the Fierro Brothers creamery in Wilmington’s Little Italy. My friend and I agree that it’s the best as it’s made locally, totally creamy and gloriously good. Sometimes I just eat it with a spoon right from the container. Mix ingredients together with a wooden spoon until blended. Brush on tops of the cookies. To make this icing smoother it can help to microwave it for a few seconds so that it will spread easier.